Skittles Math. Graphing. Converting Fractions. Mathematics has never been so scrumptious! 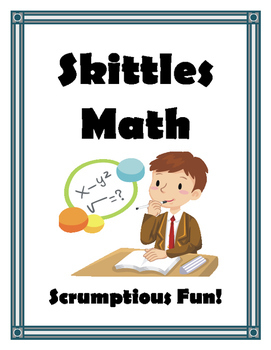 Students love Skittles Math. My best selling product is now available to use with Skittles. The project uses the original Skittle fruit flavored candies which are marketed in small packets with a range of 14 to 17 candies per packet. The project seeks to answer the inquiry question, "How does an understanding of statistics help us interpret data?" This project can be done with one class or several. At the school I teach in, a group of ten teachers teach it simultaneously so we can share data. This offers an excellent opportunity to examine sample sizes as well as provides the data to create stem and leaf plots for each color of Skittle. Stem and leaf plots are excellent graphic organizers to use to teach students to find central tendencies. The data from the stem and leaf plot is then used to create box and whisker graphs. In addition, students learn and practice format conversions. 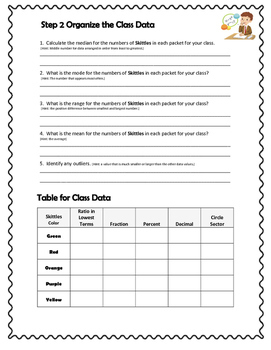 Data can be graphed using pictographs, bar graphs, circle graphs or box and whisker graphs. Calculators are encouraged as the emphasis is on skill sequencing. 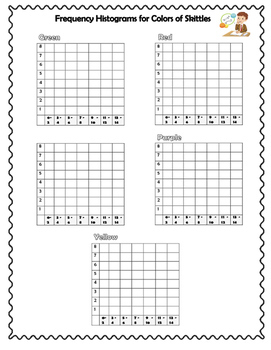 Alternate pages to the suggested booklet are included so that you can enrich or modify individual student booklets as required. 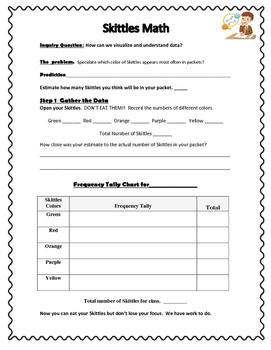 Examples of enrichment activities include finding standard deviation to verify accuracy of central tendencies and using Skittles data to write algebraic equations and solve them. I have been counting candies for fifteen years and this is definitely the math project students love and look forward to! I have presented this project at middle school conferences at the provincial level and it has been a hit. So spark up your math class and challenge your middle school students.